Most events for the 2018 year will be broadcast after our Planning Meeting and AGM - as this may change the structure of our year and our discretionary events. However, the main Haflas have been scheduled as follows, for your planning pleasure. 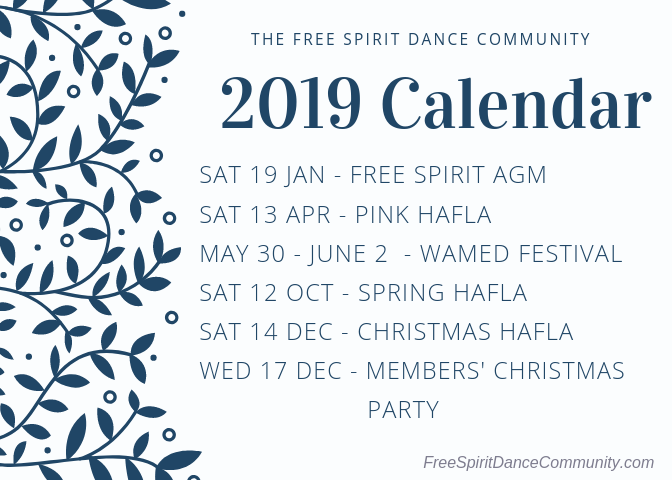 Please do join us for the planning day and/or AGM if you'd like to have some input into new ideas and directions for the Free Spirit Dance Community Inc. If you've ever said to yourself "Wouldn't it be great if...." - we'd like to know! If you can't make the day, email us today! Planning the new direction of the FSDC and dreaming big dreams. Join us! Our annual event to raise money and awareness of female cancers. Friday-Sunday, 30 May - 2 June 2019 - The WA Middle Eastern Dance Festival. The biggest dance event in WA! Proudly presented by the Free Spirit Dance Community Inc and Bellydance Central. Check out the website here. A fabulous night of performances and fun! Wednesday the 17th of December : The Members' Christmas Party! All members are invited along to the Studio for a relaxed evening of fun and frivolity.